Here, in Work Interrupted, the babe Eros floats down from his lofty perch, and before whispering into this young woman’s ear—before relating her first message of love—he ever so gently removes any obstruction that may bar her from properly hearing this most-important of messages. A woman coming of age. A woman learning for the first time of love. Learning of romantic pleasure, sexual intensity, and a new swirling ocean of ideas and emotion. What will she choose? To simply be content in love? To be ravenous in love? Or will she deny love all together? And, as important, what will Eros tell her? Will he only convey the incredible highs—or will he also mention the heart-wrenching lows? 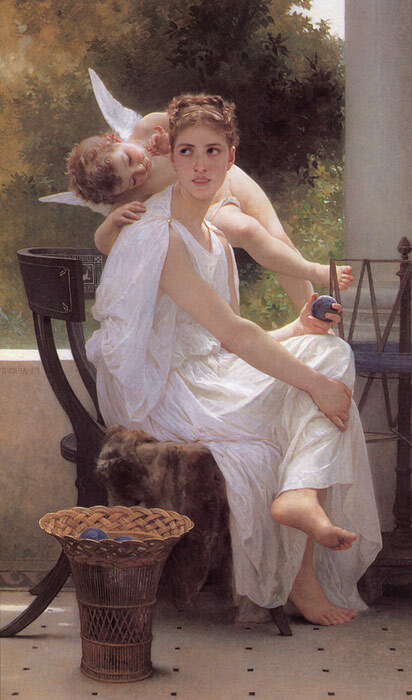 One of the many unique values of this painting of Bouguereau is that it inspires us to ask these very questions—and it begs us to think of our first love; what that love meant—and what it means to us today. But probably the primary value of the painting Le Travail Interrompu [Work Interrupted], is that we get to experience the beauty of this event first hand. To experience this coming-of-age in the most delicate of ways, conveyed by one of art-history’s most delicate of artists- Bouguereau. SPECIAL NOTE : The painter will make the reproduction as close to the original oil painting as possible. If you want your painting to alter from this likeness, please email us and " Le Travail Interrompu [Work Interrupted], 1891 " will be reproduced according to your special requirements.